Manila, Philippines - Team Bamboo's young artist Juan Karlos Labajo sang Bruno Mars' "Runaway Baby" during the grand finale Upbeat Song Round of ABS-CBN's top-rating singing competition 'The Voice Kids' Philippines on Saturday, July 26, 2014 at the Resorts World Manila, Newport City, Pasay City. 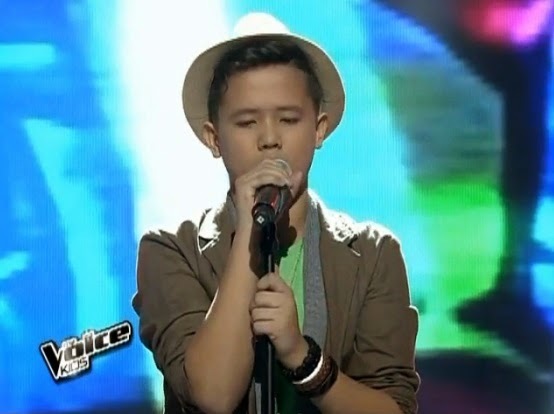 Juan Karlos, 13-year old kid from Cebu City is among the Final 4 artists the competition under Team Bamboo. "Ang charm mo talaga, nagamit sa round na ito eh. Congratulations. ", Coach Lea said. "Natural mo talaga eh. There's only one JK," Bamboo said. WATCH: The Voice Kids Philippines Grand Finals Upbeat Song Round "Runaway Baby" by Juan Karlos Labajo (video).